Felt Wee Folk revision sent off! Yes, it’s finished and sent off to C&T Publishing in California, two weeks ahead of the deadline! 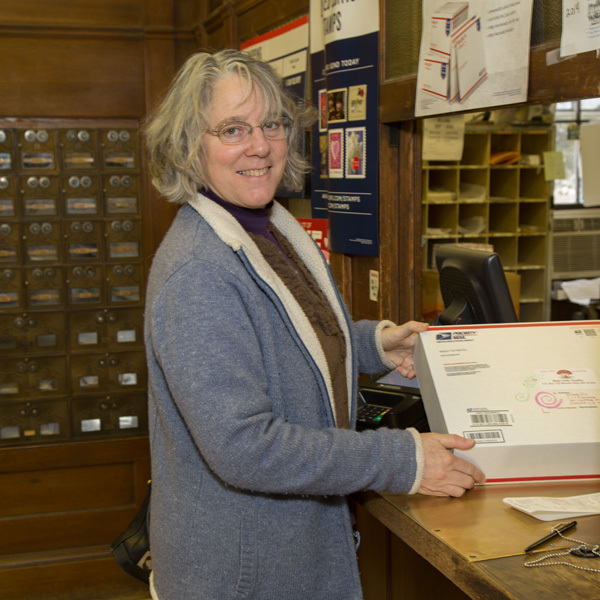 Here I am, mailing the box in the Woods Hole Post Office. It’s full of necessary parts that make a book; patterns, CD of manuscript, thumb drive of digital photos, slides, 4 x 5 transparencies and a photo log. The revised edition of Felt Wee Folk should be out in the world about a year from now, in the Spring of 2015. After months and months of designing and stitching new projects, writing directions, making how-to models, compiling lists of materials, drawing out patterns, constructing scenes and taking photographs, it feels strange to come into my studio without the pressure of working on the book. I had forgotten about the amount of fussy details that need to be taken care of, like labeling photos and inserting codes into the manuscript. I hope I didn’t forget anything! Now, it’s time to catch up on business, speak to quilt groups and make Polly Doll a new outfit for our upcoming trip. I’ll reveal the location later, when Polly’s ready. I couldn’t find her anywhere and thought she’d gone AWOL, but then I remembered that she’s been locked up in a case at the Cape Cod Museum of Art for the past few months. I’ll be picking her and the “Posies” artwork up next Tuesday. This entry was posted in 2nd edition, Dolls, Felt Wee Folk, my design productions by Salley Mavor. Bookmark the permalink. Salley– Congratulations! What a great accomplishment and relief! I can’t wait until the new book is out and you are touring around with it. Wonderful something to wait for, for all of us, and something to move on from, for you! Do you have lots of work still to do, like checking that the publishers got it all right, or does the digital world make all that easier, I wonder. Oh, yes, there are many stages in the designing and publishing process, with opportunities to check for errors and make changes. I don’t think that digital vs. analog makes much difference in the time or quality. Like a lot of things, it’s all about attention to detail! 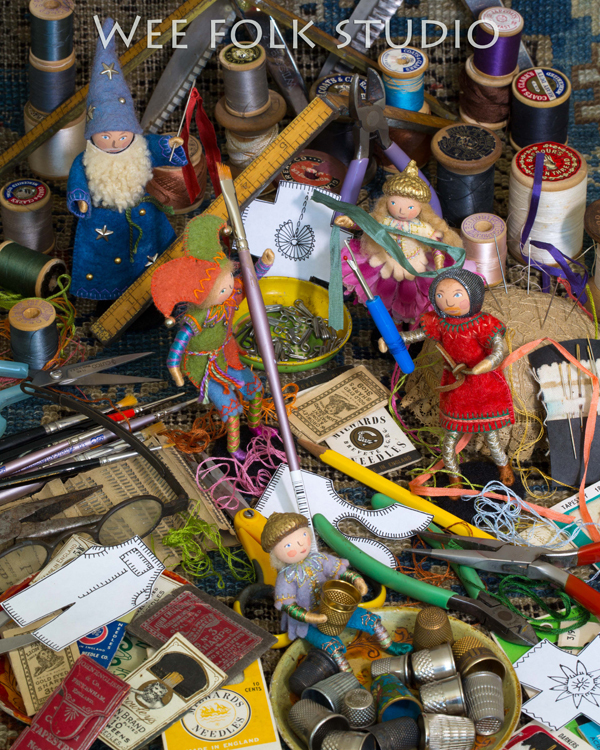 Oh, look at all those little folks into your sewing supplies. No wonder you get so much done. You have a lot of help, and probably while you are sleeping, too!!! Can’t wait for your book! The wee folk were quite helpful and sometimes it felt like they formed themselves in my hands. A lovely treat to look forward to next year! Wow, congrats! What an accomplishment. The first Feld Wee Folk was so rich with instructions, detail and imagery, I can’t wait to see the revision! I’m so glad that you’ve enjoyed the book and I think that you will like the new one as much or even more! Congratulations on finishing early Salley, and very many thanks for finding time to send me my lovely winning poster! You are amazing! I can’t wait for the new book, the first book is one of my treasured possessions, it is dog eared from so much use. Wonderful! You look rather worn. I am sure you will be glad to get out and about with Polly…your husband, too! Congratulations! I can’t wait to see the results; I’m sure it’s wonderful! Now……..I think you should head out to Oregon. The lovely shop owner at Gossamer said you spoke at her shop some years ago, while visiting family in Portland. I’m sure it’s time to make the trip again! Congratulations on the finish. It must feel wonderful to know you can take a little breather and relax for a little while. The post office photograph reminds me of the little post office in the town where I grew up. The modern post offices just don’t look like that anymore, at least not where I live. I hope you’ll show us Polly’s new outfit. Congratulations on finishing your new book…and ahead of the deadline, too! Can’t wait to see the finished product. I love your work. Sally, You look in remarkably good shape for finishing up the details for your book. And you look relieved to get it into the mail. Feel for me as i am trying to get my book into shape for circulation and it is an amazing amount of work. But worth it. All good wishes Ann B. So looking forward to the new edition of Wee Folk since I loved the first book. Happy for you that you got done early and that “it’s in the mail”, beating out your latest snowstorm too! Hope all is well on The Cape, that you didn’t get too much snow/wind, and that all of us in the NE will be seeing an early spring…just 31 days from now. It is more welcome than ever! Good for you! And for us! I first tried a large eyed needle in his hand, but the seam ripper was more visible. omgoodness! I just discovered your first book a couple weeks ago and finally got (I hope) all the materials I need to start a couple of projects! Now a new book! Wonderful!!!!!!!! I can’t wait!!!! Congratulations! Wow! Very surprised to hear about a new book. I love the original, and making wee dolls, even now that my kids are older, is one of the most enjoyable things I do. Saving them all for someday, maybe grandchildren. Do you have a place (newsletter list?) I can add my email address to, so that you can send a mass email when your new book is available? If not, I will keep checking back. Thank you.